Meet a group of young students who are doing what they can to help you reduce palm oil in your life to protect the forests and people. Bali, 20 June 2016. Kids Cut Palm Oil are one of the youth groups leading the GINKalimantan Conference Youth Workshops in September 2016. Snack wrappers are pinned up to remind all on the ethics of food production. Thank you Kids Cut Palm Oil for taking action against forest destroying palm oil. 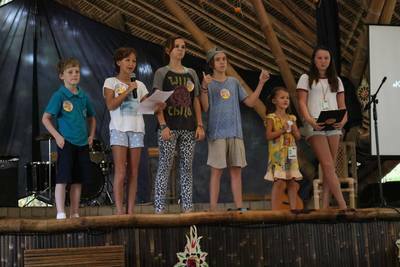 This group of committed youngsters, many of whom are international school students based in Bali, came together as a result of seeing the destruction of the tropical peat land forests of Sumatra and Borneo in Indonesia. They learned that the major cause of this environmental crisis was the production of conflict palm oil. Not only that, they learnt that much of the planting is done on land that has been acquired illegally. They were surprised however to discover that palm oil is a major ingredient in many of the items that they were using daily, from snack foods and cereals to shampoos and soaps. Members of Kids Cut Palm Oil (KCPO) saw footage of orang-utans dying, people in masks enduring days with no sun and burning air, and heard stories of young children hospitalised just from breathing in the air. Having watched Heart of the Haze, a documentary filmed during the worst of the fires, the students heard from firefighters who were battling the flames with hardly any equipment, who were risking their lives to save others. Yet they found their lives and the lives of their friends were full of the products that caused this destruction. That became the moment they knew they must act. So they created a campaign. That’s how Kids Cut Palm Oil began. The KCPO campaign hopes to create global awareness in tandem with worldwide actions to make sure that kids know about the choices they can make to save the animals living in the forests and prevent their future from permanent and irreversible damage. Educational materials are available to teachers and groups in boosting forest conservation, which will supplement Kids Cut Palm Oil campaigns and shows. Today KCPO campaigns reach international schools through the vast networks of school alliances and social networks. Since the KCPO inception, the students have created educational packs that help students of all ages and their teachers create inquiry based learning units. They also believe in spreading good news and helpful information on alternatives to conflict palm oil. To date the campaigners have reached out to schools in Indonesia, Australia and the United States and delivered presentations, raised petitions and prepared educational materials. With these, students are now more aware of the need to cut conflict palm oil from their lives in order to grow up in a world that sustains all life forms. Watch this too. A young member. Liela, from the UN School in New York, created a presentation to help people understand more about why kids as well as adults, should be cutting palm oil from their lives.